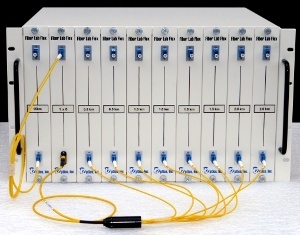 The Flex-PON solution from M2 Optics provides the ideal platform for those seeking to exactly simulate a passive optical network in the test environment. By enhancing this popular chassis to include optical splitter modules, a user can now work with a complete point-to-multipoint setup that includes all applicable fiber lengths found in the field network. Contact our experienced team today and we will help to determine the best solution for your application. With many leading organizations around the world relying on Fiber Lab, we are confident you will benefit in a similar manner.